The trail is almost complete. Do bare in mind that it is very new and will take several years to be up to the standard of other popular trails around the world. Some stages are well developed and others are not fully way-marked or may even be overgrown in parts. A number of people have walked the trail in its entirety and it is not without challenges! A GPS is still essential so that you can regularly check that you are still on track. Check maps with your current location if you have not seen a way-marker for a while. Some stages are very well way-marked and others are not. Expect to wander off track once or twice! Some parts of the trail have plenty of accommodation, others are lacking. There is also not much budget accommodation. Most hikers are finding wild-camping the best way to do the trail. If you prefer to stay in accommodation such as Bed & Breakfasts, it will require planning along the way and the occasional taxi if the accommodation is off-trail. Hikers are finding local people to be very helpful in giving advice for a camping spot or the nearest accommodation. There will always be a place to stay; just be willing to take a taxi off-trail sometimes. Roughly 50% of the trail is on road. The 50% that is off-road goes through fields and often boggy areas. Hikers have reporting being "ankle deep". Use hiking poles. Wear waterproof socks. Waterproof everything! Summer is the driest time of year and the ground is much more firm. The Leitrim Way is still under re-development so maps are not yet available. Way-markers are still lacking in a few other parts of the trail. The cycle trail is mostly on road and overlaps with the walking trail in many parts, roughly 50%. The Beara-Breifne Way cycle trail is also not fully way-marked. The Ulster Way does not have an official cycle route, however most of the trail is on road. Where can I find maps for the trail? ​A guidebook with maps and accommodation for the trail is available on this website. Alternatively, many of the maps are available to download for free from ﻿﻿www.IrishTrails.ie﻿﻿ and www.WalkNI.com/ulsterway. On the maps where it says 1 km and 1 mile for the map scale in the bottom corner; the 1 km is correct but the 1 mile should be .5 miles. Stage 6 - Ormond Way, Toomevara: accommodation closed down. Stage 6 - Ormond Way, Ballingarry: accommodation closed down. Stage 9 - Lung/Lough Gara Way - O'Carolan B&B closed down. Alternative is Hill House B&B outside of Keadue. The Ormond Way is now complete and maps are available on www.irishtrails.ie. Print these to bring along with you. Is there plenty of accommodation along the way? ​Accommodation consists of mostly Bed & Breakfasts with only a few hostels, hotels and campsites. Most of the trail has enough accommodation within a day's walking distance, though not all. Budget for taking at least four taxi's to accommodation and to get dropped off again the next morning. Some accommodation-owners in rural areas may be willing to collect you. AirBnB can be useful for extra accommodation options and is noted in the guidebook in areas with a shortage of other accommodation. Accommodation is sparse in Northern Ireland from Stages 13 to 18, see paragraph below regarding distances. Try to book accommodation in the smaller towns in advance. Some accommodations are closed during the winter months. How much does it cost to walk the trail? ​There are currently 6 hostels on the trail and they charge around €18-€25 per bed per night. The rest of your accommodation are Bed & Breakfasts and a few hotels which can cost around €60 - €90 for two people sharing with breakfast included. More hostels will likely open up over the coming years which should make the trail more budget-friendly in the future. What about camping and campsites? On the Ireland Way there are only a handful of campsites. However, you are allowed to camp anywhere along the trail so long as you ask the landowner's permission if you can see their house. Most land is privately owned and hundreds of farmers have kindly given permission for walkers to go through their land. Usually in the mountains there is no house for miles so you can camp freely. Just be sure to take your litter with you. How long does it take to walk/cycle? ​To walk the entire 900-km/500-mile trail takes around 40 days. Cycling the trail takes roughly 2 week. To-date the fastest thru-hike is 36 days by Tom & Marc Glintschnig. What are the distances to walk each day? Walkers will need to be able to walk from 5km up to 29km in a single day. When is the best time of year to walk the trail? The summer months, June, July and August will be the warmest and driest time of year to walk the trail. These three months are the main tourist season so some accomodation could be full at weekends. Book accommodation a few days in advance if you can or be prepared to take a taxi. The trail is the most pleasant at this time of year with lush green landscapes. March and April are the next best time to walk the trail. It is spring time and trees are starting to grow new leaves and new lambs may be seen prancing in the fields. March weather varies, April is warmer. September weather varies a lot. it could be a nice warm sunny September or a wet and windy one! There may be stormy days followed by sunny days. October is getting much colder and wetter and the sunligh-hours getting shorter. November, December and February are very wet and can be very windy and go below freezing. Only walk these months if you enjoy that kind of weather and come well prepared with suitable warm and waterproof clothing. Deep invisible puddles in long grass, plenty of mud, large puddles, sliding into bog up to your knees, thick fog in the mountains and a risk of hyperthermia if you get stuck in the mountains alone. If you are lucky, ice will harden the ground and make it more walkable. The days are also much shorter with daylight from around 8.30am to 5.30pm. Is it safe to travel alone in Ireland? 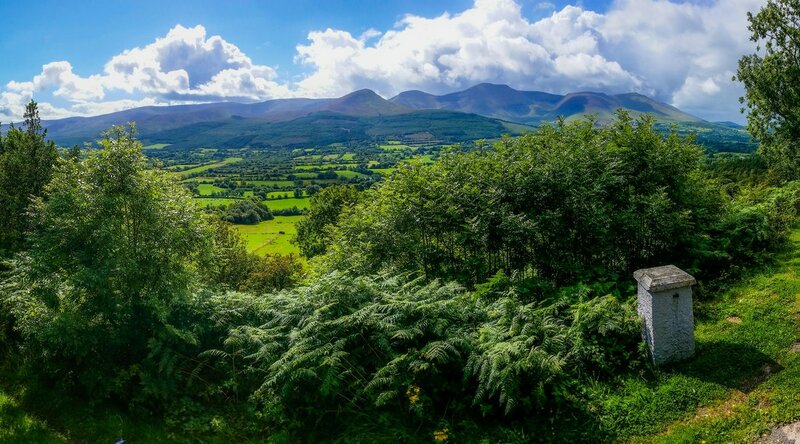 ​You can read about the safety of travelling alone in Ireland on Tripadvisor. Is there any danger from animals on the trail? The primary danger to look out for are bulls. They are extremely dangerous. Each time you enter a field scan it thoroughly before proceeding. 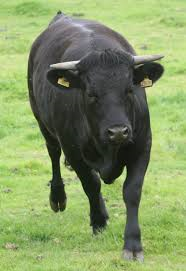 If you see a bull (often with a ring in its nose), do not enter the field and find an alternative route. In springtime cows with calves can also be very dangerous. Read about how to escape a bull. How much of the trail is on road? ​Approximately 50% of the trail is currently on road. Although most of the roads are very quiet country roads, it is advised to take care and wear a high-visibility jacket. Flashing lights may be used for additional visibility. Are there any unsafe parts I should know about? ​As they are not yet finished, the main sections to be careful on (or use public transport for) are stages 6, 9 and 11. Some trails cross busy motorways. Use caution walking on roads or crossing roads and wear a high-visibility jacket. Dogs are not permitted on most of the Stages. This is because the trail goes through farms with livestock. Permission has been granted for walkers to pass through these farms on condition that dogs are not allowed. 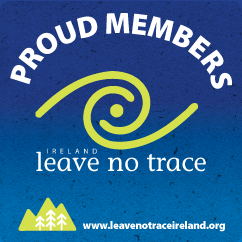 You can check each Stage of the trail separately on www.irishtrails.ie and www.walkni.co.uk to see if dogs are permitted. Can I do the trail by horse? Currently it is not advised to do the trail by horse. You would need to use the cycle route (all on road) for most of the trail as the walking trail has many stiles in and out of private land. Many of these roads may not be suitable for horses. We hope to have more information regarding this in the future. What counties does the Ireland Way pass through?